Begun by Sam Walton in 1983 with one store aimed at helping other small-business owners get deals by buying in bulk, Sam's Club has grown into a popular warehouse store. Today, its 650-plus locations are aimed at helping anyone find bargains on everything from toilet paper to TVs. But not everything in Sam's Club is a good deal. Some of Sam's offers should be, well, left to Sam. GOBankingRates asked a group of top savings experts to sniff out the best deals at Sam's Club -- and the worst. Click through to find out how to get the most bang for your buck. Do you want to know what Sam's Club deals probably live up to Sam's standards? Here are 10 of the best Sam's Club deals. 1. Batteries. Energy is expensive -- especially when it comes in the small, portable form. But Sam's Club can help, said Regina Conway, consumer expert for Slickdeals.net. "You'll pay as much as $1 less per battery than if you purchased them full price at the grocery store," she said. And, this is one item where it pays to stock up. "Check expiration dates, but these should be several years out, so it makes sense to buy in bulk," said Conway. 2. Over-the-counter and prescription drugs. While she suggests always comparison shopping for medications, Conway said Sam's Club should be on the list -- whether you're a member or not. "Because of drug regulations, the stores cannot require you to be a member to buy prescription medications," she said. That can pay off. "Some medicine carried there can cost as much as 50 percent less than local pharmacies," said Conway. 3. Christmas trees. Apparently, Sam's Club is a great place to get into the holiday spirit, thanks to deals on that most important Christmas decoration. Sam's Club, along with other warehouse stores, stock up on trees, making it easy for them to give great prices, said Conway. "Bear in mind, however, that negotiating opportunities will be thin at warehouse stores," she warned. "[Also] check out the faux tree deals at the warehouse stores. They'll get you through several seasons, saving you more each year." 4. Eggs, butter and cheese. You can find good deals on eggs, butter and cheese at Sam's Club, said Teri Gault, CEO of TheGroceryGame.com. "Eggs, butter and cheese are almost always the best possible price any time of year," she said. "Expect to save 30 to 50 percent compared to supermarkets. This is due to the fact that these are staples that don't often have high-value coupons, and the most competitive sales at supermarkets are usually only on certain holiday sales events." 5. Brand-name tires. Pushing your tires until they're as bald as an eagle isn't smart, and thanks to Sam's Club, you won't have to, said Jeanette Pavini, savings expert with Coupons.com. "Aside from attractive prices, Sam's Club's $15 per tire installation package includes services like 24-hour emergency roadside services for three years and lifetime tire balance, rotation and flat repair," said Pavini. 6. Movie tickets. Going to a dinner and a movie isn't as cheap as it used to be. So, Pavini suggested cutting the cost by picking up movie tickets (and maybe snacks?) at Sam's Club. "We found two adult tickets for $16.98," she said. "Since you're typically buying a voucher you can exchange for a ticket, make sure you use it at a peak time. For example, use it on an early-bird matinee and you may lose money. But use it on an evening show, and you'll come out ahead." 7. Televisions. If need a new TV, you'll want to do careful comparison shopping. But, you'll also want to include Sam's Club in the mix, said Lindsay Sakraida, director of content marketing at DealNews.com. "Sam's Club occasionally features TVs at competitive prices, making them a major player to consider when perusing for a big-screen set," she said. "However, most of the deals apply to lesser-known brands, like Vizio." 8. Health screenings. We all know that health care is expensive, which is why a free health screening could be the best deal at Sam's Club. 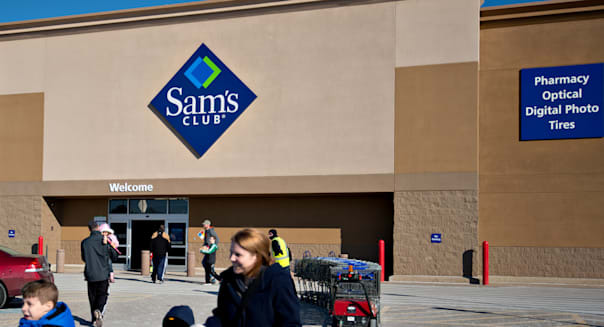 "Periodically throughout the year, Sam's Club will offer free health screenings for men and women that check for blood pressure, body fat percentage, total cholesterol, glucose/HDL cholesterol and vision," said Sakraida. 9. Gift cards. Hardly anything is better than free money to spend on your favorite meal or song, which is why you should take advantage of discounted gift cards at Sam's Club. "Many people don't realize that they can score deals on gift cards, but Sam's Club will offer price cuts on cards for the likes of Applebee's, Fandango, Outback Steakhouse and iTunes," said Sakraida. For example, a $100 worth of P.F. Chang's gift cards sold for $79.98 on the Sam's Club website. 10. Party food. When it's time to party, count Sam in. "Most food items sold in large quantities are not only a great deal but will keep you stocked for large family or work gatherings," said Conway. "From frozen appetizers and finger foods to desserts and gift baskets, you'll save 30 percent over local supermarket deals." Her one warning is not to buy more than you need. Waste is a bargain hunter's worst enemy. Avoiding bad deals is just as important as jumping at good ones. So, here are 10 Sam's Club deals you might want to skip. 1. Meat. Grab the eggs, butter and cheese, but leave the meat, said Gault. "The one or two featured meat sales at supermarkets will beat warehouse club stores by a lot," she said. She suggests bulking up on supermarket meat sales. "Invest for your freezer. There's always one or two sales a week that are 50 to 67 percent off, and lower than warehouse club stores," Gault added. 2. Some produce. Warehouse stores like Sam's Club don't offer seasonal sales on produce, so often you'll find much better deals at your supermarket when it features a seasonal sale, said Gault. "I always say bring the sales circular, or look it up on your smartphone before you pay 50 percent more or even twice as much," she said. 3. Toilet paper and paper towels. Paper products tend to be a pretty flimsy deal at Sam's Club and other warehouse stores, said Conway. Per sheet, toilet paper ends up being roughly the same price at the grocery store and Sam's Club. However, with a sale or coupon, you can easily find a better deal at the grocery store, she said. "Papers towels cost 50 percent less at merchants such as Target or the grocery store when on sale," added Conway. 4. Luggage. The good news: Sam's Club has high-quality suitcases, said Conway. The bad news: They're more expensive than using an online coupon code. "Macy's, for example, has a two-piece Samsonite luggage set comparable to that at the warehouse clubs for a lower price," she said. "Coupled with a coupon code for 15 to 20 percent off available at Slickdeals.net, the savings are even greater." 5. Coffee. This is another good news, bad news scenario, according to Pavini. "You can get really great deals on coffee when you shop at warehouse stores, but here's the catch: Coffee is only at its peak for a limited amount of time," she said. "So while you'll certainly save buying the 2-pound bag of coffee, it may not be optimum quality by the time you reach the bottom of the bag." Pavini suggested grabbing a coupon and hitting the grocer instead. "Recently, I found around a dozen coffee-related offers in the beverage section at Coupons.com," she said. 6. Soda. Soda, the young guns' coffee. But don't look to Sam to give you the bargain basement price. Grocery stores often have great sales on soda around popular holidays and sports events, said Conway. "Typically, during these sales cycles, you can expect to pay about 17 cents per can at the grocery store versus the normal low price at a warehouse club for 25 cents per can," she said. Pavini recommends doing your soda bulk shopping at a grocery store instead of Sam's Club. "If you're planning to buy in bulk anyways, you can often find good deals at grocery stores, like buy two 12-packs and get three free." 7. Cereal. Yes, you can buy jumbo boxes of cereal for a seemingly good price at Sam's Club, but often you can do a lot better if you wait for sales at the grocery store and use a coupon, said Pavini. "Since cereal coupons are one of the most popular coupon categories, there are always deals to be had," she said. "Plus, while unopened cereal will last for months in your pantry, once opened the big boxes may get stale before you get to the bottom." 8. Condiments. Sure, that gallon of mayonnaise might be a fantastic price, but do you really want or need that much? Pavini said that considering the possibility of waste, it might be more penny-wise to wait for the fridge-sized condiments to go on sale at the supermarket. "Keep in mind that fatty-based products, like mayonnaise and olive oil, have a shorter shelf life once opened," she added. "Make sure you're able to finish it before it goes bad, or it's wasted money -- no matter how good the deal." 9. Pantry items. Packaged foods -- canned foods, pancake mix, salad dressing and almost anything in the center of the supermarket aisles-- are cheaper when on sale at supermarkets than at Sam's Club, said Gault. "The sale price is usually 20 to 40 percent less," she explained. "Adding a coupon makes the regular-size boxes on sale often half the cost per unit or cost per ounce than the huge bulk packages at warehouse club stores." 10. Membership fee. If you haven't joined yet but are thinking of spending $45 or $100 for a Sam's Club membership, Conway said you should hold out for a deal. "LivingSocial and Groupon feature deals approximately every three months or so for Sam's Club discounted membership rates, plus store gift cards," she said. With the store incentives, it's practically a free membership. "If you're shopping for a membership, set a 'Deal Alert' on Slickdeals.net," advised Conway. "You'll receive an email notification when a deal matching your criteria becomes available." This story, 10 Best and Worst Deals at Sam's Club, originally appeared on GOBankingRates.com.